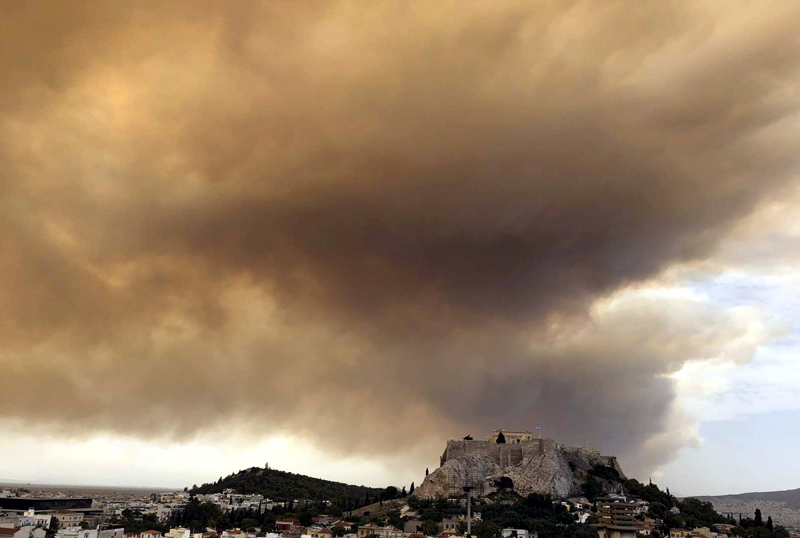 A swift-moving forest fire burned through a mountainous area west of Athens on Monday, prompting residents to flee as smoke from the blaze turned the sky over the Greek capital a hazy orange. The fire department said 80 firefighters with 40 vehicles were on the scene near the seaside settlement of Kineta, 50 kilometers (30 miles) from Athens between the capital and Corinth. Seven water-dropping planes and four helicopters were also helping to fight the wildfire. Authorities were sending 17 firefighting vehicles from across Greece to bolster forces already in the area, but strong winds with frequently shifting gusts were hampering firefighting efforts. [post_ads]Three communities were being evacuated and the forest fire shut down a nearly 20-kilometer (13-mile) section on two highways linking the Peloponnese with central Greece. Thick smoke reduced visibility on the highway to mere meters (yards). Several houses were in flames, footage from the Greek TV station Skai showed. Some residents used garden hoses to try to save their properties, while others escaped in cars and on mopeds. It was not immediately clear how the fire started in the Geraneia mountains near Kineta. A separate wildfire broke out on the southern island of Crete, the fire department said, burning agricultural land and woodland. Two helicopters there were assisting dozens of firefighters. High temperatures of up to 40 degrees Celsius (104 Fahrenheit) have been predicted lately for Greece, and authorities have warned that the risk of forest fires is high. Forest fires are common in Greece during the hot, dry summers. The worst by far occurred in 2007, when large swaths of forest and farmland burned, mainly in the Peloponnese in southern Greece, killing more than 60 people.